The customer relationship management (CRM) market is currently being dominated by two major methods of assessing business growth: customer acquisition rate and customer retention rate, both of which demand quality customer engagement. With CRM contributing immensely to improve customer interaction, organizations are now, more than ever, leveraging such tools for quicker discovery of potential clients and better management of existing customers. Today’s marketers face an overwhelming amount of data and are challenged to find ways of generating accurate insights. Artificial intelligence, machine learning, and predictive algorithms are key to solving this issue while removing guesswork out of marketing decisions. A large number of service providers and developers are reinventing CRM by harnessing the latest technology trends such as VoIP, web services, embedded analytics, business intelligence, and social media. Meanwhile, customer communication is progressing through orchestrated multichannel campaigns. As communication traffic is directed more toward mobile, CRM on mobile is expected to overtake other CRM channels in the coming years. 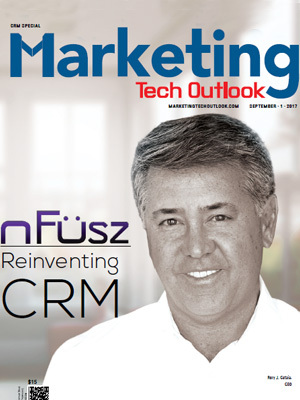 To help CTOs, CIOs, and CEOs find the right CRM solution provider, a distinguished selection panel comprising CEOs, CIOs, VCs, industry analysts, and Marketing Tech Outlook’s editorial board has selected solution providers that deliver innovative CRM technologies combined with latest marketing strategies. We evaluated vendors’ ability in developing solutions and services that can effectively yet economically ensure productive customer relationship management. We present to you Marketing Tech Outlook’s Top 10 CRM Solution Providers 2017.